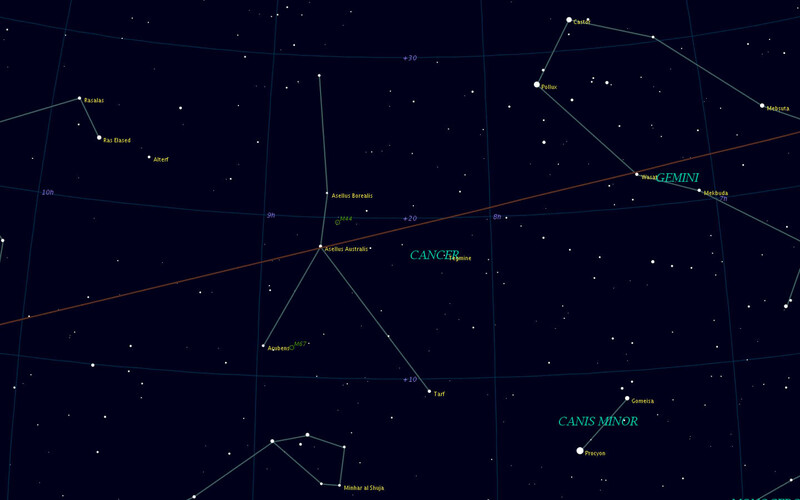 Cancer is a mid-Winter constellation between Gemini and Leo with a delightful star cluster, The Beehive Cluster (Praesepe), a fine binocular object. Alpha Cancri, "Acubens" (claws), is not the brightest star in this faint constellation. Delta Cancri, NNW seven degrees, holds that distinction. Not only that, but delta is the centre of the most interesting part of Cancer, the 'head' of the crab, while alpha is only one of its legs. Nevertheless, let's begin our investigation of Cancer with alpha, for there is a Messier, M67, in the same FOV. Finding the stars of Cancer could be a bit of an adventure, particularly if you don't enjoy the darkest of nights and the blackest of skies. With the naked eye spot Procyon. If you aren't sure which star this is, begin with Orion. Due east of Betelgeuse and south of the twins Gemini is the brightest star in this region Procyon. Now move eastward two full fields of vision and you'll come across the Hydra's head. Put this asterism that forms Hydra's head just out of view at the bottom of your glasses and you'll have alpha Cancri at the top. Centre this star. To the southwest of alpha is beta, found exactly half-way between alpha Cnc and alpha CMi (Procyon). Iota1 Cancri is a yellow giant (4.0) accompanied by a bluish companion (6.6) -- position angle 307� and separation 30.4". The binary system is known as Struve 1268. The companion is a good test for binoculars; you should have no trouble with 10x50s or larger. Iota forms the end (or 'claw') of the upper leg. To find iota, place gamma (the northeast corner of the square surrounding the Beehive Cluster) at the bottom of your glasses. Now move due north one full FOV. You're near the top of the constellation, near Lynx. In fact moving from iota up through the sigma Cancri stars is a convenient way to find Lynx. Zeta Cancri is a multiple star 83 light years distant, although it will take a small telescope to see all three sixth-magnitude components. The closest of the three has a rapid orbit of 59.5 years. Zeta is due west of delta, just outside the same field of view. Putting theta on the far left edge of your field, you'll find zeta just off-centre.